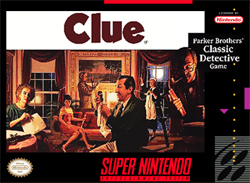 Based on the classic board game, Clue for Super Nintendo features a group of Mr. Boddy's friends at his estate who are involved in a murder mystery. Collect evidence and make deductions to solve the game. Play against the computer or up to five human opponents, starting at the Amateur level all the way to Detective level.